In 2010, a homeowner with a severe mold sensitivity had a problem: how could he safely be in his own home to coordinate with insurance adjustors, remediation professionals, and other contractors following the discovery of a major mold problem? He had to make sure that everything was taken care of so his family could return from the hotel where they had been relocated. The simplest answer was to keep the mold spores from getting into the air in the first place. If they stayed stuck the surface they were on, he could go into the affected rooms to answer questions, take pictures, and meet with professionals without the coughing, sneezing, and itching he had felt since the problem started. Using materials available to him, the homeowner developed what would become the first MoldHold prototype—a set of large patches that he stuck to the moldy walls and floorboards where his refrigerator and cabinets normally would have been. He soon stopped itching and was able to be on site when he needed. The next morning, the crew working on his kitchen asked the homeowner where he got those patches—they had never seen anything like them and were excited about a safer, easier, and more cost-effective way to contain mold. In response, he started MoldHold to make the product available to professionals and other homeowners who needed a quick way to prevent mold from getting in the air before and during remediation. 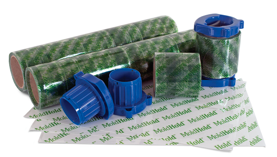 Now, MoldHold has become the industry leader in efficient and effective source containment. Every element of the MoldHold product is engineered to trap mold and other airborne toxins from making it into the air for people to breathe. Since that first remediation job, MoldHold has been used to contain mold, asbestos, and lead around the world, saving homeowners, insurers, and remediation specialists time, money, and most importantly, their health.